Wall mounted bed pan cleaner. Trigger operated hand spray with 65 degree nozzle. 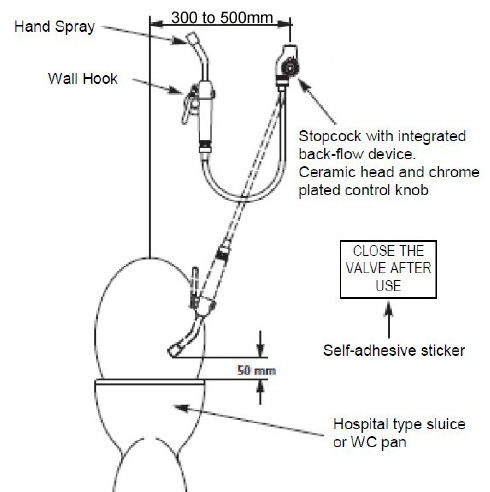 The bed pan cleaner features a wall mounted valve with quarter turn control. Supplied with either a chrome plated back plate elbow for exposed water supply or through wall connector for concealed water supply. The bed pan cleaner has an integral vacuum breaker to prevent back contamination of the water supply. 1m long reinforced white opaque nylon flexible hose. White wall hook with screws for hand spray. Bed pan cleaners are ideal for use with our sluice sinks and hospital equipment. In stock usually 3 to 5 working days. To see the full range of hospital slop hoppers and sinks.